collected from a local cage farm. Well it’s been a fun ride and we have now finally come full circle for the Aquaculture project in Kenya. As I mentioned way back in May 2018 a small group from the Inorganic Geochemistry team (IG) at British Geological Survey (BGS) in collaboration with The School of Environmental Sciences at the University of Eldoret (UoE), The School of Veterinary Medicine and Science (UoN), and the experienced research team at the Kenyan Marine Fisheries Research Institute (KMFRI) based in Kisumu, Kenya were successful in winning funding from the Newton-Utafiti International Links programme with the British Council. The project investigated problems of “food insecurity” in the Kenyan portion of Lake Victoria (only 6%) and the implications of both anthropogenic pollution and land run-off from changes in land use (soil erosion) and their impact on the health and nutritional quality of aquaculture farmed fish for “food safety” as proxies for pollution. 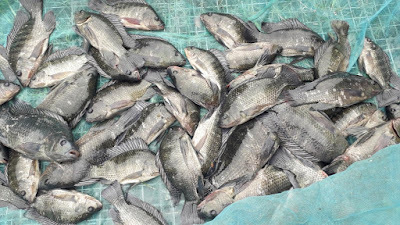 The idea of exploring how micronutrients contributed to Aquaculture fish, their nutritional quality and the associated problems of pollution pathways and food security were challenging, working in the second largest Lake in the world. Sampling locations were difficult to navigate due to thick matts of water hyacinth (Fig 1) and collecting waters, sediment grabs and cores in 2 metre swells in the Lake would have tested the most hardened of sailors. Nonetheless, water, sediment samples and most importantly wild and caged fish samples were collected from the May, November and January sampling trips for the project. Samples were prepared in Kenya ready for shipping to and analysis at BGS to identify sources of potential circulation of pollutants from the north to southern locations of Kenya’s borders. trace element concentrations; Aquaculture cages (20 x 20m) housing 10,000+ Nile Tilapia. 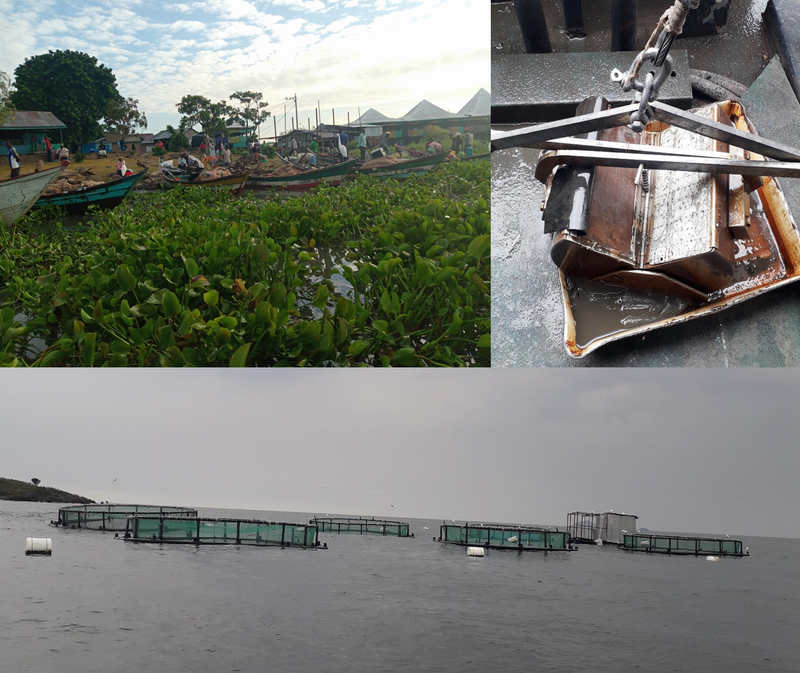 Initial findings of the Aquaculture project were disseminated at a stakeholder’s workshop including NGOs and local aquaculture cage owners and fisheries managers. The workshop was held on the 25th January at KMFRI headquarters with an introduction from our hosts KMFRI about the Lake and it’s management, followed by talks given from the Aquaculture project leaders Dr Andy Marriott (BGS, PI) and Prof Odipo Osano (Eldoret, Co-PI) and a talk given from Safina Musa a member of the KMFRI research team. A breakout was then organised with those attending split into four groups to discuss the findings of the project and to highlight their concerns for the fisheries, aquaculture farming and the state of the Lake. The groups having elected their spokesperson would then put their questions to the project team leaders. Questions from the aquaculture aspect and what possible impact cage culture would have on the local fishermen and water quality were predominant with problems of environmental issues pertaining to the overwhelming issue of water hyacinth were also a major concern. headquarters; Safina Musa discussing the state of aquaculture in Kenya from the KMFRI research team. Dr Marriott explained that “wild fisheries and aquaculture coexisted in a relationship and not one of competition” with “one helping to sustain the other” e.g. preventing possible future fish stocks collapsing. Additional to this, was the importance of fish not only as a protein source but for their essential micronutrients which could be one of a number of potential routes to food security in the Kenyan diets. However, fish alone are not the only answer to the provision of essential micronutrients, they also need to be supplemented with a diversified diet e.g. kale, sukuma wiki (collard greens), pumpkin leaves, to boost these as part of the recommended daily intake (RDI). Moving on from the fisheries discussions, water quality and information on pollution and their pathways were addressed with Prof Osano indicating the “problem was more widely dispersed than just localised input”, with areas covering the drainage basins in Kenya and their effect on the Lake again highlighted from his presentation. Gaps in the knowledge base needed to be addressed, with both the input contributions “point source” and their impact “end point” effects will need to be monitored if we are to implement measures to control, reduce or more importantly understand these environmental impacts. Collaborative projects between UoE and BGS (Geo-chem & Health, Kenya Rift Valley, IG in Kenya Part II) are continuing to assess the issues of environmental impacts from anthropogenic activities and their connection with health. Further funding for PhDs and MScs hopefully will contribute further to the research. Finally, an address was made by Lilian Wanjohi (British Council, Kenya) and Caroline Nyanoti (British High Commission, Nairobi) part of the Newton-Utafiti International Links funding body, in congratulating all involved in the Aquaculture project and the achievement of the findings, which highlighted the need to continue to monitor and manage the Lake and to address the concerns of all who use and live in and around its waters. Dr Marriott concluded that future funding had been successful (Nottingham-GCRF seed funds) which would continue our work from the Newton-Utafiti project through to summer 2019. A further bid is in place (BBSRC-GCRF), which if successful would mean continued work to 2021 on the Lake studying problems of pollution in Aquaculture and wild fish e.g. Food Safety, Human and Ecological Health, through water quality assessments studying associated sedimentation rates in water from soil erosion and changes in land-use. I would like to thank the Newton-Utafiti International Links programme and the British Council for funding the project and allowing us to do this research. I would also like to thank the BGS-ODA programme and Center for Environmental Geochemistry for their continued financial and technical support. I would also like to thank all of the participants from the County Government of Kisumu, Lake Victoria Environmental Management Program, National Environment Management Authority, Lake Basin Development Authority, Kenya Maritime Authority, Jaramogi Oginga Odinga University of Science and Technology and researchers from KMFRI who took time to attend the workshop and give us invaluable feedback on the Lake. Eloise: BGS Apprentice and Woman of the World!